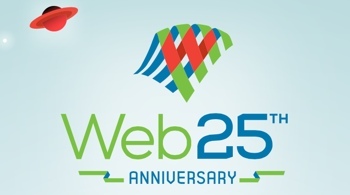 As you may have seen on Google, Wednesday marks the 25th anniversary of the World Wide Web. Created by computer scientist Tim Berners-Lee as a way to create links between his pages of notes, the Web has since blossomed into a worldwide marketplace, a clearing house for ideas and yes, the home of a humble site called Techlicious. Now, Berners-Lee and a host of partners have taken up a new project called Web We Want. It’s an effort to create an Internet Users’ Bill of Rights that hinges on five key principles: Affordable access; the protection of personal user information; freedom of expression; diverse, decentralized and open infrastructure; and neutral networks free of discrimination against content or users. You can add your voice to the effort by submitting your contact information on the site. Berners-Lee is also involved with Web at 25, the official anniversary site hosted by the World Wide Web Consortium. On it, you’ll find information on the Web, thoughts about its future, and a discussion about how to defend the core principles of an open Web. You can participate in that discussion on Twitter using the hashtag #web25. You can visit Web We Want at webwewant.org; Web at 25 is available at webat25.org.